Tour a European city in these tailored classics in shades of camel and merlot. These designs are from the October 2011 issue of Burda Style magazine. All instructions to previously published patterns have been updated. A long Wrap Dress is closed with a sash and large bow. The wrap shape creates a flattering V neckline and looks good on every body type. Don’t miss the buttoned cuff detail. 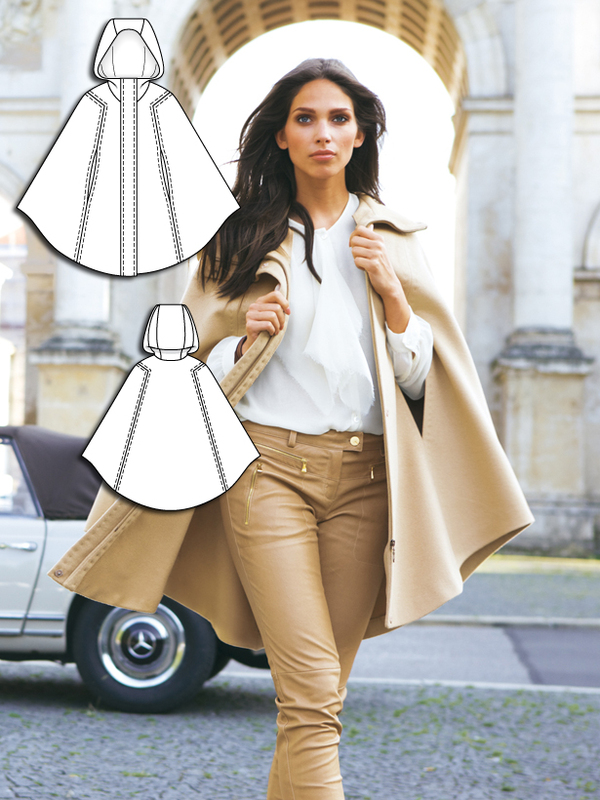 Cover up like a real fashion editor in this elegant Cape with a full zipper and hood. It’s an elegant coat alternative in any solid color. This menswear style Velvet Waistcoat is made to fit your body with a shorter cut and pointed hem. Make it in velvet for an extra feminine look to change up the look of trousers and a blouse. An attached scarf has a lovely romantic look when tied in an oversized bow. 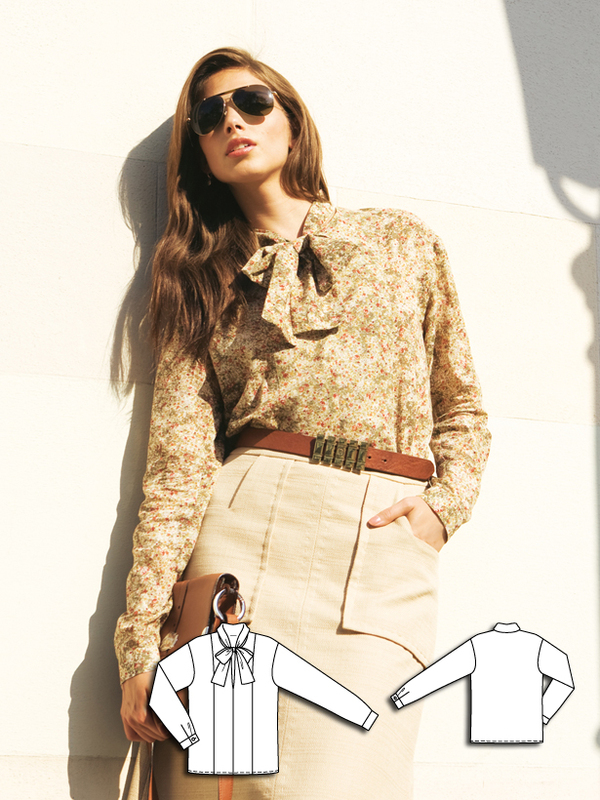 Make the Tie Neck Blouse flutter in lightweight batiste. Velvet is soft and warm in this collegiate style Jacket. This blazer is finished with a double-row closure and wide lapels. A relaxed Skirt with Pockets finished with embroidery. The slightly flared shape has back darts and a side zip for fit. A knee length Trench Coat made of faux leather with a belt is sleek and polished. The neckline is made warm and cuddly with flannel lapels. These mid rise Bootcut Flannel Trousers are ultra flattering. They lengthen the leg with a slight flare. The back is left smooth but the front has decorative patch pockets for a finished look. Fight the chill in this super quick and luxe feeling Cowl. It’s a self-drafted project you can finish in a few hours. Mix these sophisticated classics in with your favorite trendy pieces for a perfect fall wardrobe. The wrap dress looks great with boots, or pair the bootcut trousers with a strappy tank and a long cardigan. This makes a good SWAP (sewing wit a plan). The colors would mix and match with many others; the pieces all coordinate; the design is simple but key items have extra design, like the crochet front on the blouse. Oh nooo! I webt to buy the October issue and this collection was not there!! Where can i find it please? This was also one of your best issues. Between these patterns and the Coco inspired ones this issue was so great. I love all of the 70s inspired patterns you guys put out and would love to see another editorial like this in future issues. Great collection! But how about the pattern for the pants in the photo with the cape pattern? Love the double front zippers. Thanks! Is there a pattern for the feminine white blouse? Shown with the boot cut pant, model is standing on the steps. I need to make that cape!